to teach the children of YASHARA'EL HIS Commandments, Statutes and Decrees. whosoever doeth any work in the Sabbath day, he shall surely be put to death. to observe the Sabbath throughout their generations, for a perpetual covenant. made heaven and earth, and on the seventh day HE rested, and was refreshed. and all the host of them. had rested from all HIS work which ELOHIYM created and made. HALLELUYAH! cease, celebrate, (make to) rest. a Sabbath of rest to YAHUAH: whosoever doeth work therein shall be put to death. came, and went in boldly unto Pilate, and craved the body of YAHUSHA. he asked him whether he had been any while dead. And when he knew it of the centurion, he gave the body to Yoceph. and laid him in a sepulchre which was hewn out of a rock, and rolled a stone unto the door of the sepulchre. (Again YAHUSHA died on the Preperation Day just before the HIGH HOLY Shabbat Day. and they shall hear my voice; and there shall be one fold, and one Shepherd." for that HE is strong in power; not one faileth. Weekly" as commanded by YAHUAH our ELOHIYM. 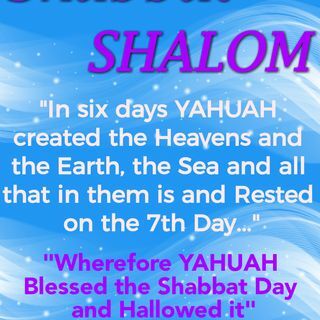 In the New Covenant/Testament, we see YAHUSHA HA'MASHIACH kept the Shabbat. TORAH of YAHUAH ELOHIYM. HalleluYAH. of the FATHER,) full of grace and truth. And ELOHIYM did rest the seventh day from all HIS works. and some of my servants set I at the gates, that there should no burden be brought in on the Sabbath Day. but hallow ye the Sabbath Day, as I commanded your fathers. and the inhabitants of YERUSHALAYIM: and this city shall remain for ever. and it shall devour the palaces of YERUSHALAYIM, and it shall not be quenched. not to work in it as it is a sign between HIM and YASHARA'EL"
and get back to being TORAH observant and following YAHUSHA HA'MASCHIACH. sins and heal their land." cleanse us from all unrighteousness." and there is no work involved whatsover...(no grocery shopping...no errands running...a Day of sweet repose and rest. He that turneth away his ear from hearing the TORAH, even his prayers are an abomination.